This issue is our annual deep dive on salaries and job satisfaction. And I wonder how satisfied the 46,000 employees at Smithfield Foods feel knowing their company is being sold to a Chinese company – and their CEO, in a difficult year for the company, made nearly $12.9 million, including $11.8 million in performance bonuses. 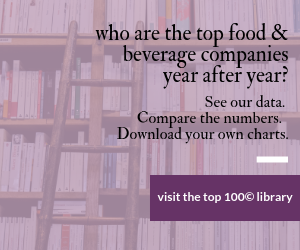 It's remarkable for the fact that, for the first time in the seven years we've been doing our annual Salary and Job Satisfaction Survey, the average annual salary in the food and beverage industry has hit six figures. $103,988 is the average we came up with, and that's based on a sizable 1,094 responses. There are, however, plenty of caveats to go with that number. The median actually was $75,500. This year there were more respondents in the above-$200,000 categories than ever before -- 52 in total, compared to 33 last year. And there were seven who claimed to earn more than $500,000 a year -- unprecedented! Apparently we have some rich friends. But those kinds of friends can throw off any attempt at an "average" salary. Before I forget, thank you to the 1,094 of you who took the time to complete this lengthy survey back in May. Speaking of salaries, a report on CEO salaries leads off the news pages of our printed magazine. This, too, has become an annual affair for us, although the data comes from research done by the Hay Group, a global consulting firm, and The Wall Street Journal. We focus only on the food and beverage CEOs, and while they're a lot further down the 300-company list, there's still plenty to gawk at. Irene Rosenfeld, a perennial front-runner, tops the list at $21.6 million. Her income includes a $1.55 million base salary (not unusually high for this group) but all the bonuses and stock options bring her compensation up to that astronomical figure, which puts her No. 21 on the 300-company list. And why not? Last year she pulled off one of foodland's biggest divorces, the split of fun, fast-growth, international Mondelez from frumpy, low-growth and domestic Kraft Foods. As a result, Kraft's new CEO, W. Anthony Vernon, made "only" $6.6 million last year, according to the Journal-Hay report. "It’s a bright, warm February day in Boca Raton, Fla., but Irene Rosenfeld doesn’t look happy. At an industry conference one week after reporting disappointing fourth-quarter results, the chairman and CEO of Mondelez International, formerly Kraft Foods, is defending her new company under a barrage of questions from irritated financial analysts." I'm right now looking into Mondelez's annual report – as I am for many of the companies that will make up our annual Top 100© list next month – and I see 2012 revenue down 2.2 percent from pro forma figures for 2011; and net earnings down nearly 10 percent. Although in the waning days of June, as I write this, there's a slight run-up in Mondelez's share price. Why? Because some investors are speculating it could be the next big takeover. Which brings me back to Smithfield Foods, the subject of my previous month's editorial. I felt bad the ham company was being taken over by the Chinese and laid part of the blame on a significant stakeholder, Continental Grain, which was impatient with a couple years of an underperforming stock price. Then I looked again at this year's CEO pay list, and there was C. Larry Pope, only the CEO (not chairman also) of Smithfield, at No. 5 on the list, up there with the CEOs of Mondelez, Coca-Cola, PepsiCo and Heinz – all of whom also were chairmen. And ahead of Ken Powell at General Mills. Pope's base: an average $1.1 million. But based on his company's stellar (?) performance last year, he got $11.8 million in bonuses, for a total 2012 take of nearly $12.9 million. That's more than 7 percent of the company's net income for its fiscal 2013 (which ended this April 28). Imagine what he's getting in the acquisition by Shuanghui International Holdings. You know what Smithfield's 46,000 employees will be getting. What do you think the CEO of Shuanghui International Holdings makes?